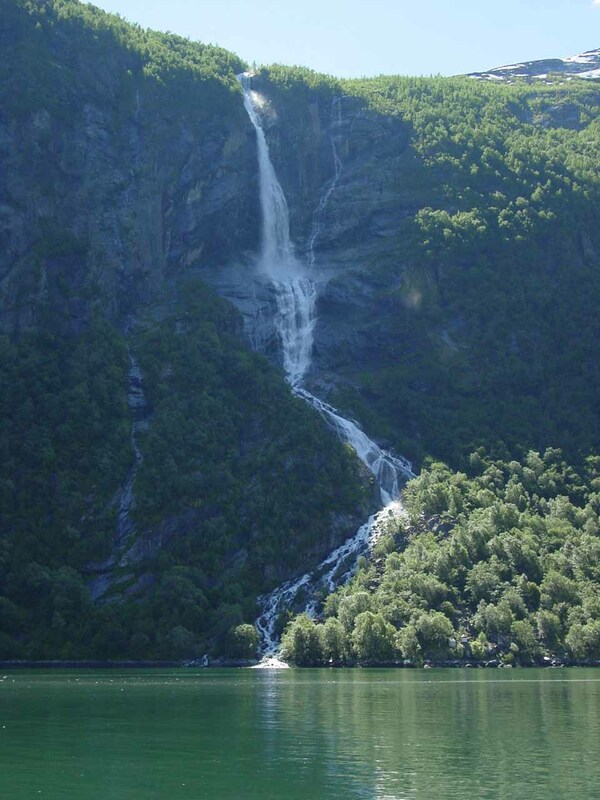 The Seven Sisters Waterfall was certainly the most famous of the waterfalls in the Geiranger Fjord (Geirangerfjorden). 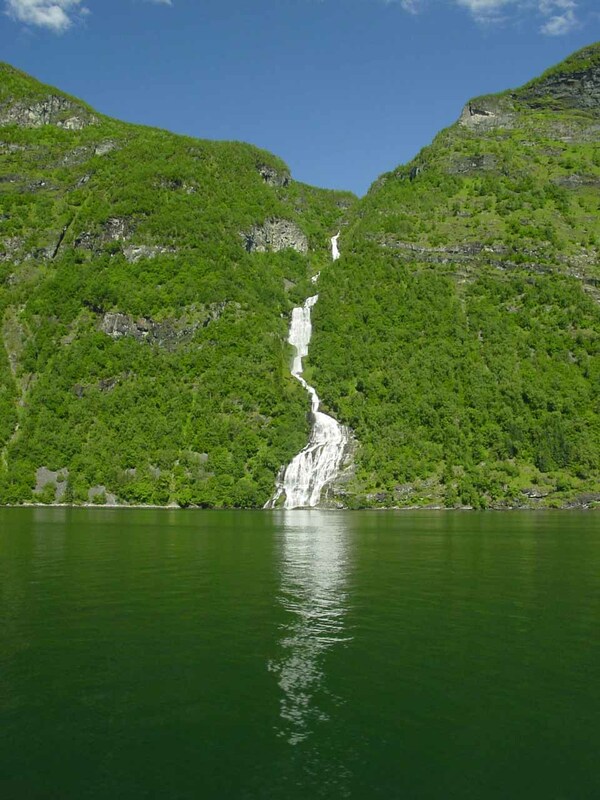 Julie and I did the cruise on the world famous Geirangerfjord largely in anticipation of seeing this waterfall. However, we ended up getting more than just the waterfall. 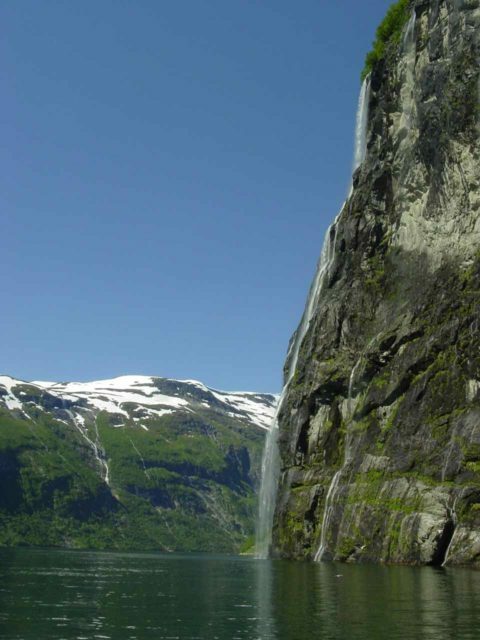 Indeed, we got a very memorable experience that also allowed us to better appreciate the steep walls and cliff-hanging farms as well as other major and minor waterfalls draping both sides of the fjord. Coupled with the beautiful weather that we happened to be experiencing during our time on the tour, we simply couldn’t have asked for a better visual experience. 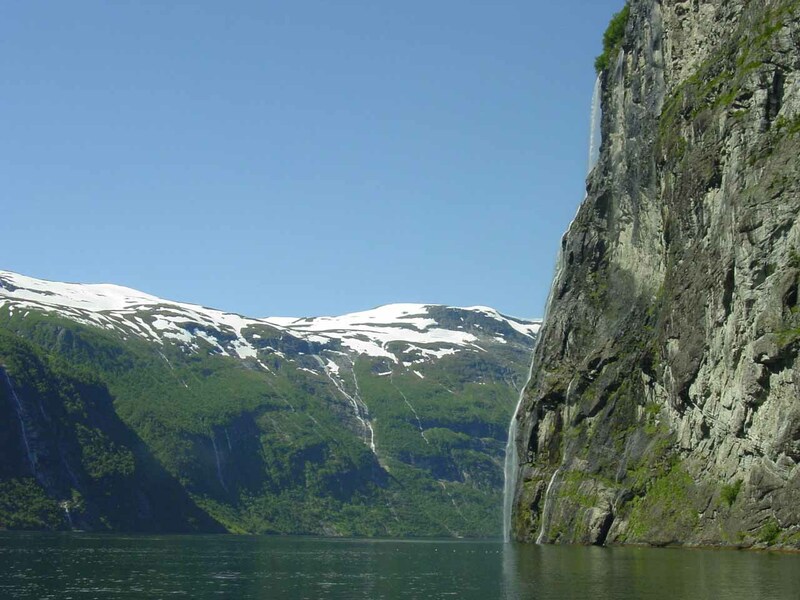 In fact, the Geirangerfjord was gazetted as a UNESCO World Heritage Site during the year of our visit in 2005. Are there really seven sisters? 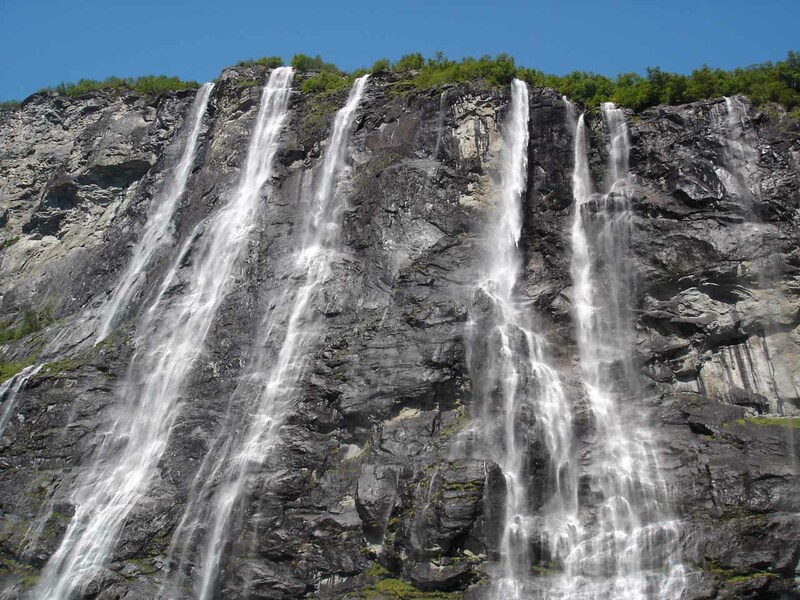 As for the Seven Sisters, it consisted of a series of several columns of water with the tallest drop said to be 220m. I’d imagine that someone must have envisioned there were seven of these columns, which was how it got its name. As you can see from our photo above, I don’t think we were able to count seven of them. 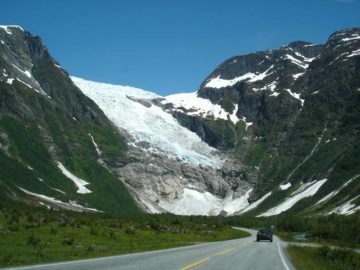 But perhaps that all depended on the amount of snowmelt or rain. Besides, I had read from the literature that it was rare to actually see the stream segment into seven waterfalls. 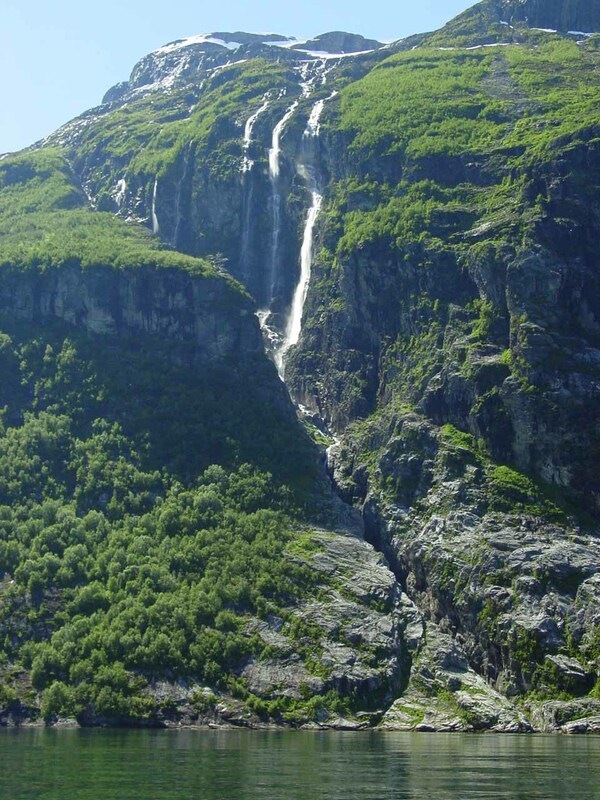 In terms of nomenclature, we noticed that the falls also went by the Norwegian names of Dei Sju Systrene or De Syv Søstrene. 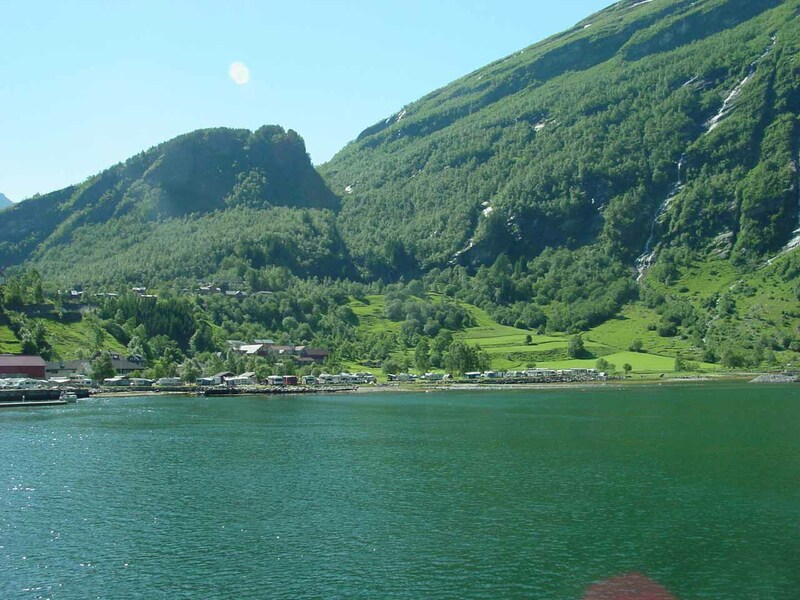 Given that there were multiple ways of saying “seven” in Norwegian (sju or syv) as well as “sister” (søster eller syster), I’m sure there could be many permutations of these Norwegian names. 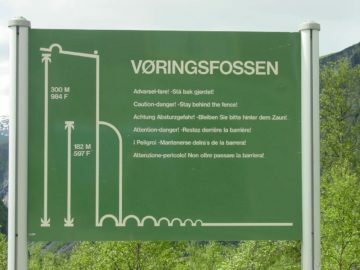 That said, from looking at the Norgeskart map, the falls flowed from the series of streams called Knivsflåelvane so the falls could also be more formally named Knivsflåfossen. 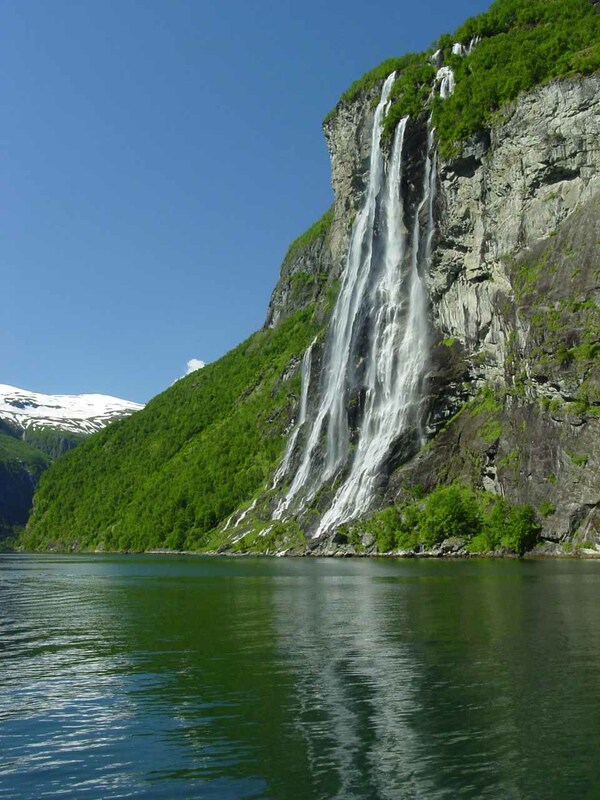 We mentioned earlier that our visit to the Seven Sisters Waterfall involved many other waterfalls. 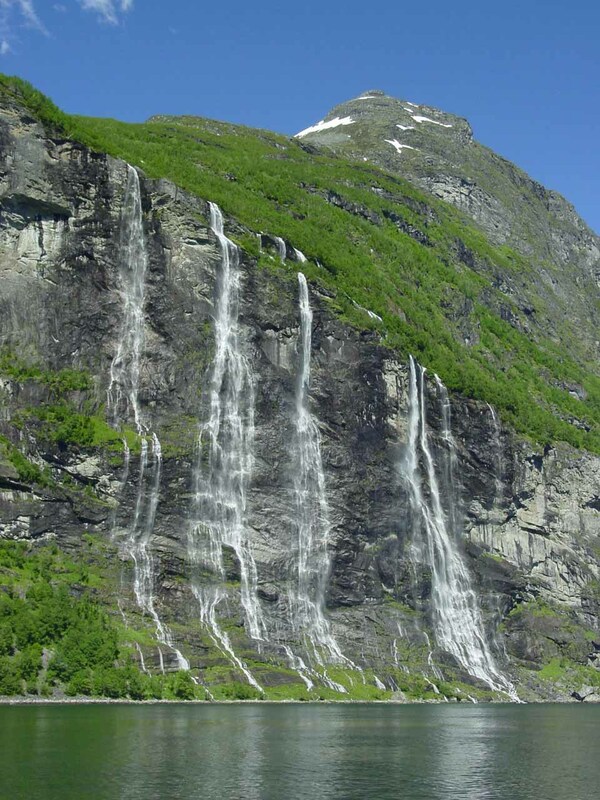 So we’ll continue this writeup with the progression of the waterfalls that we managed to see during our visit in July 2005. 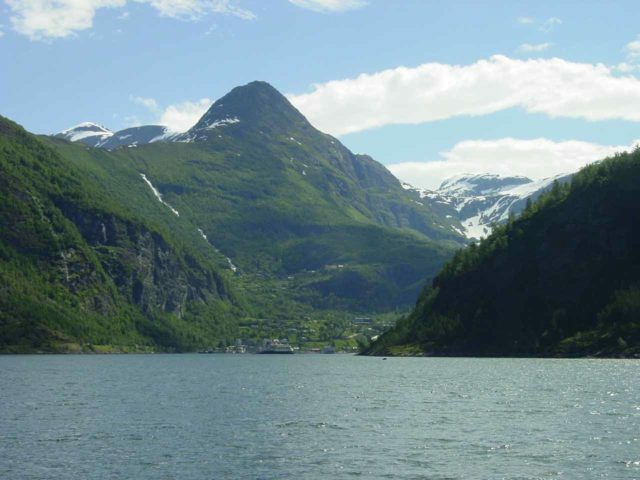 First, as we left the port at Geiranger at the east end of the fjord, we started to see the serpentine road Ørneveien (or Ørnevegen; meaning “the Eagle Road”) on the north side. Just a short distance west of the road was the waterfall Gjerdefossen. 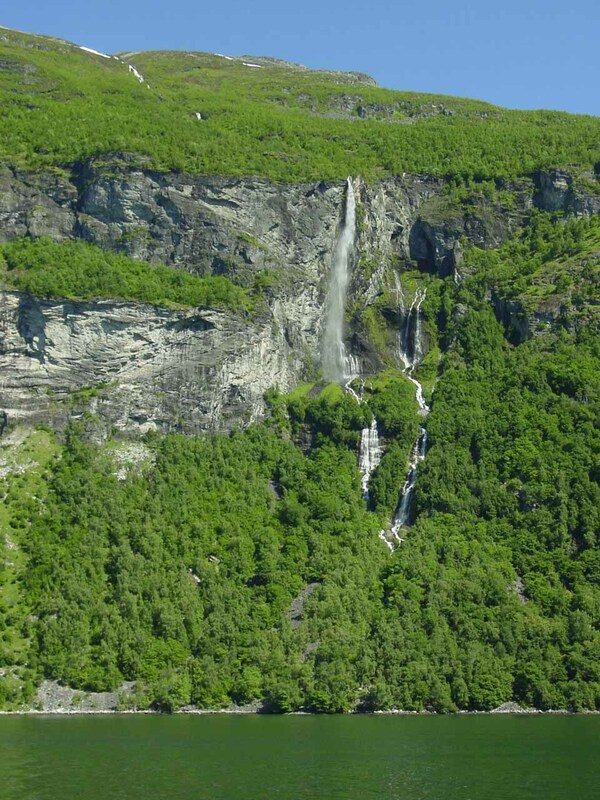 It was a tall but light-flowing 200m waterfall during our visit, but from looking at the map, it appeared to have a trail that left the Eagle’s Road towards a profile view of the falls overlooking the scenic fjord. 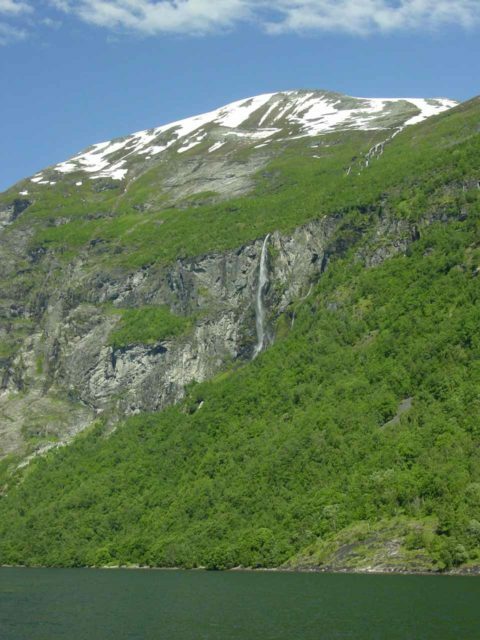 After Gjerdefossen, the next major waterfall to the west was on the watercourse Bringa. 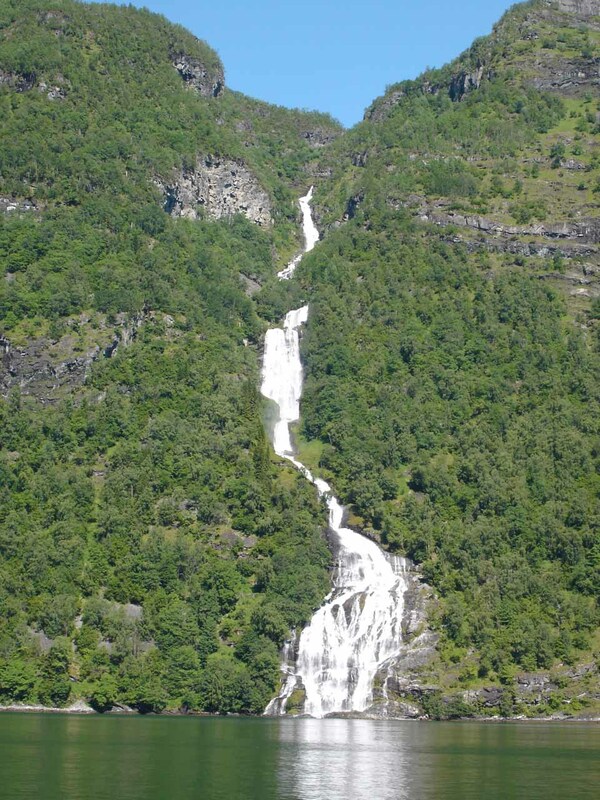 Strangely, this waterfall didn’t have a formal name despite its substantial flow compared to Gjerdefossen. 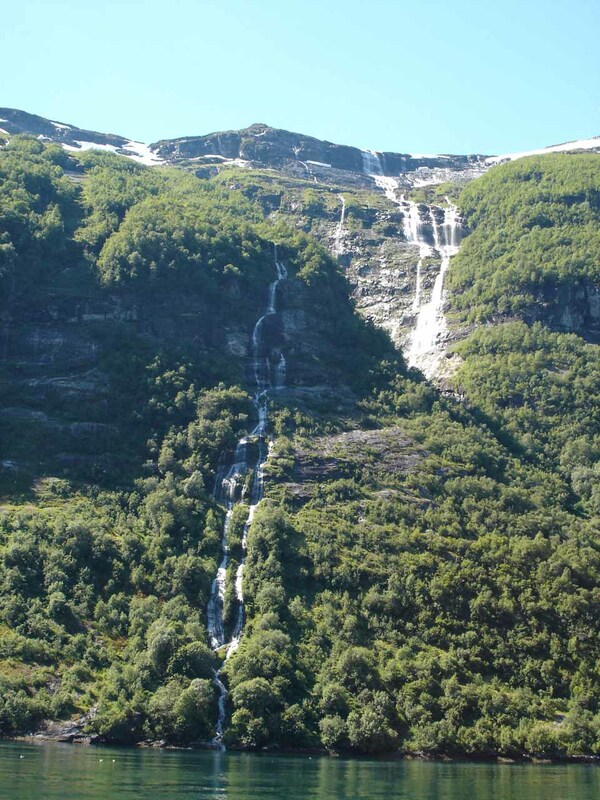 We’ve informally called it “Bringafossen” or “Bringefossen”, and it was a nice lead-in to the next waterfalls just to the west. 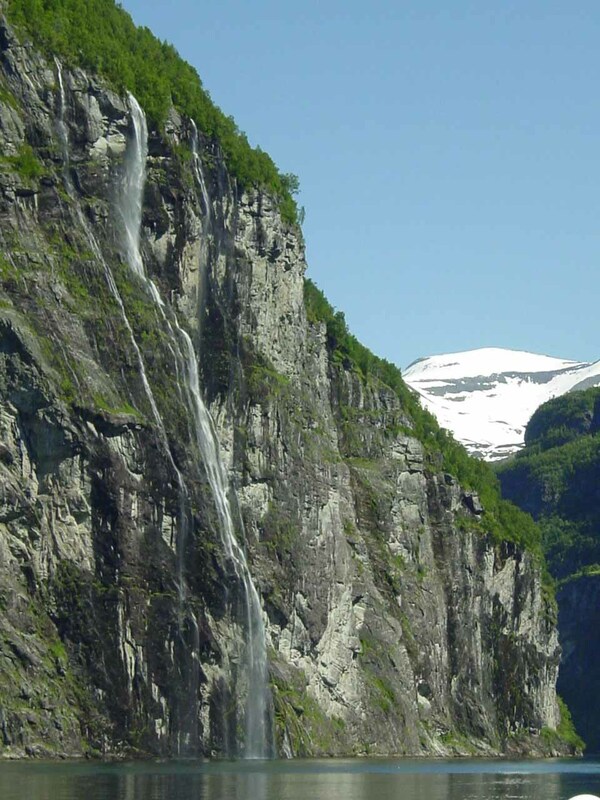 It was only many years after the fact did we finally learn that this waterfall was said to be more formally called Gomsdalsfossen. 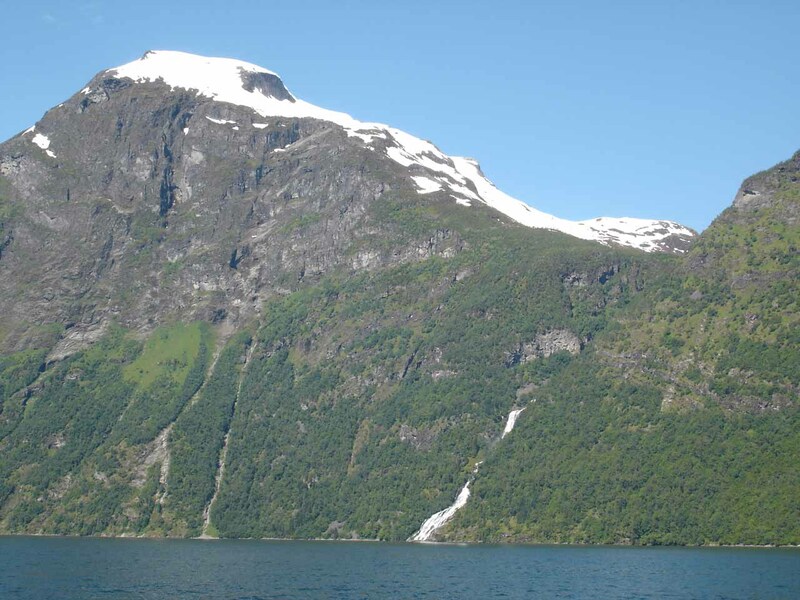 Indeed, after Bringefossen, we then went into the middle of the fjord where we saw the Seven Sisters Waterfall to the north as well as another waterfall called Friaren right across the fjord to the south. 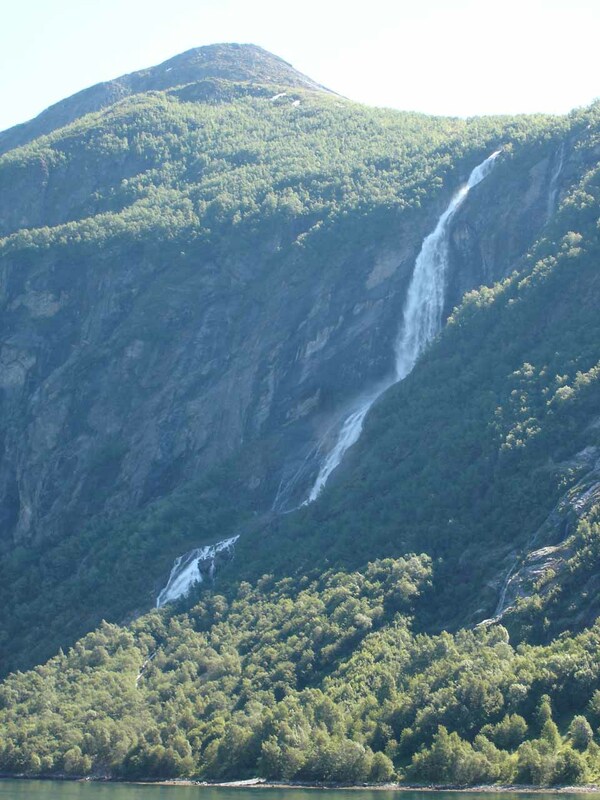 Given that this large and voluminous 250m tall waterfall was all alone with the Seven Sisters in sight, Julie and I heard a story perpetuated by the tourist boat cruise we were on explaining how the falls got to where they were. 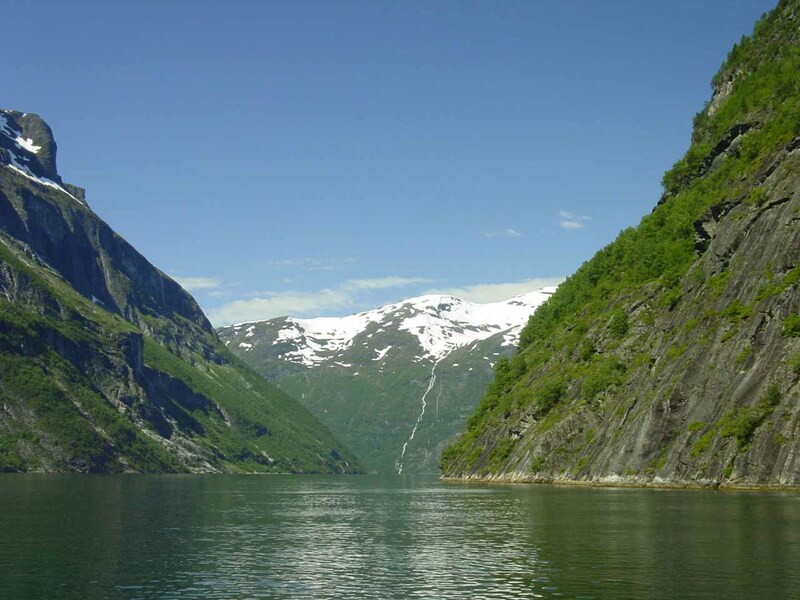 Legend had it that the Friar was trying to woo the sisters across the fjord so he could have them to himself. 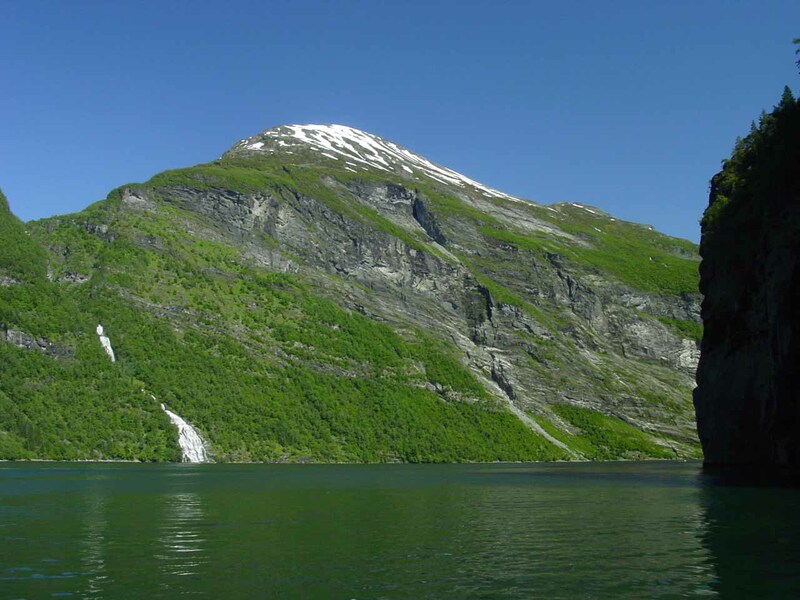 He only managed to make it as far as the fjord but wasn’t able to get any closer. More formally, Friaren was on the river Geitelva, which tumbled beneath the farm Skageflåsætra. It actually consisted of two named sections because its inverted fan shape had a plunge section then a fan section below it. The plunge section was more formally called Geitfossen while the lower section was officially named Skageflåfossen. 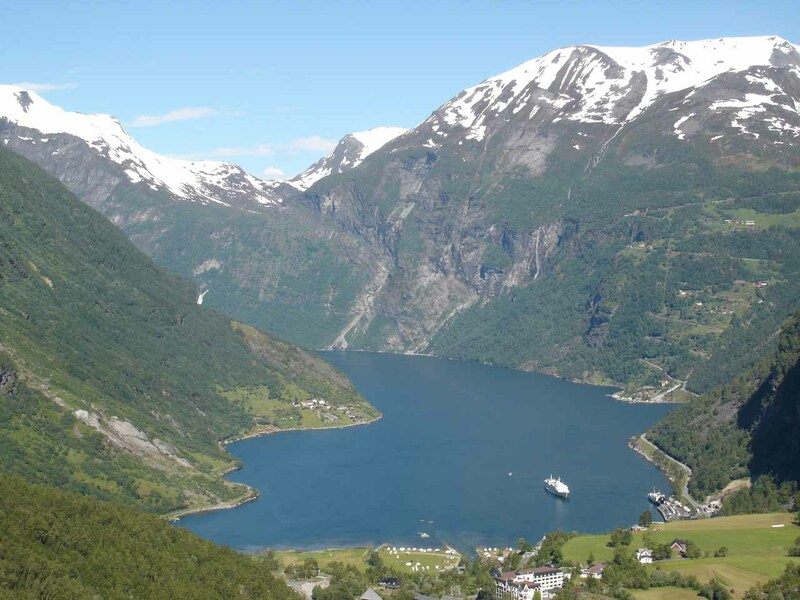 By the way, we were told that all of the mountain farms hugging this fjord (including Skageflåsætra) were abandoned from a combination of avalanches and the Black Death (bubonic plague) that decimated most of Europe during medieval times. 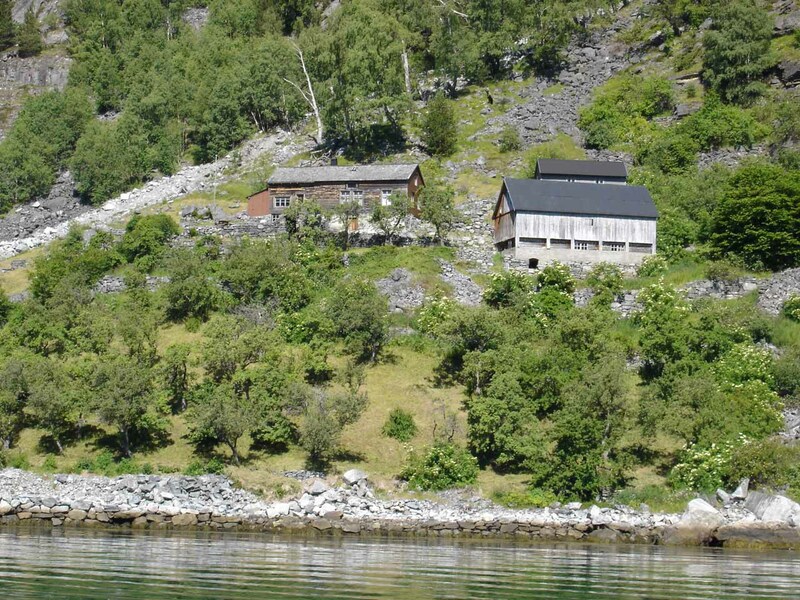 The gazetting of the fjord as a UNESCO World Heritage Site was more from the heritage of these farms as opposed to the scenic beauty of this place. 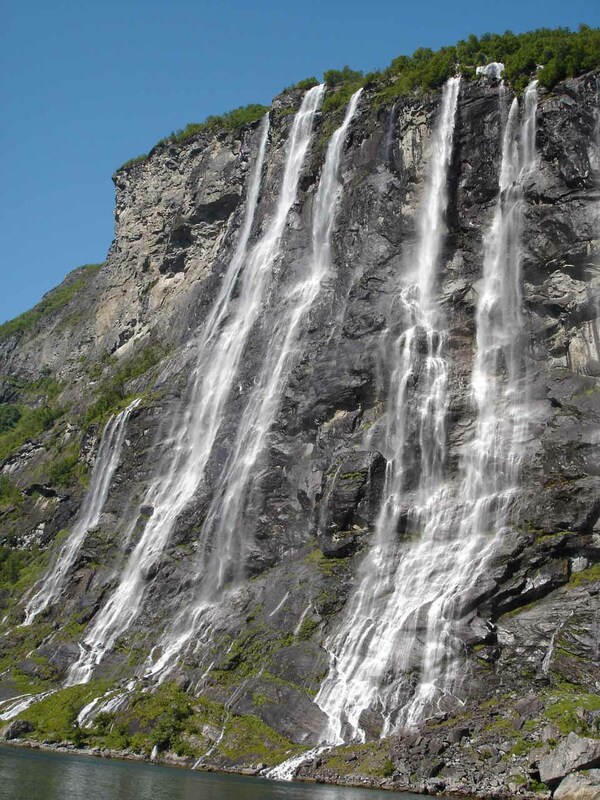 Further to the west of the famous Seven Sisters and Friaren, was the thin but very tall plunge of Brudesløret (the Bridal Veil). 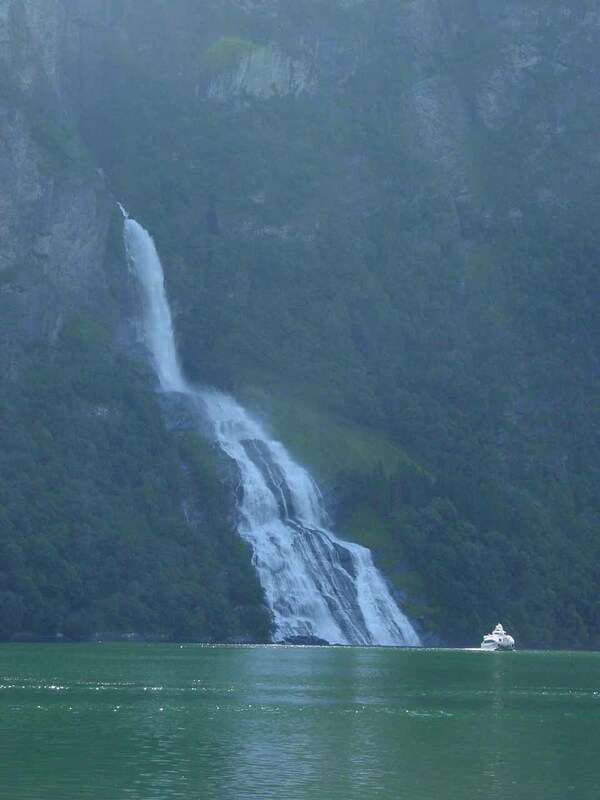 It was said to be the tallest singular freefalling waterfall in the fjord (I recalled the boat might have said something to the effect it was 1000ft tall). 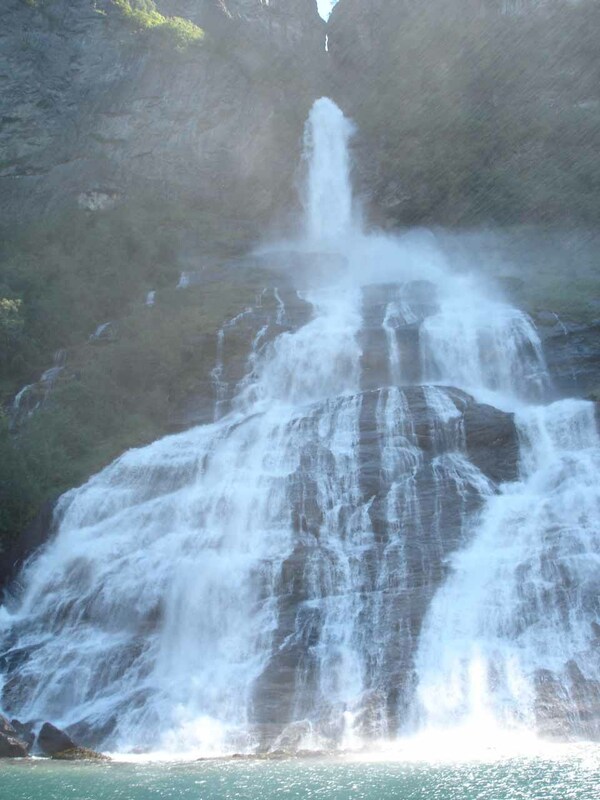 We particularly remembered this falls because there was an attractive rainbow in its mist at its base. 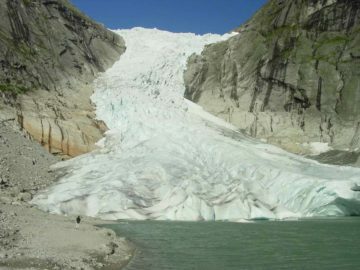 Almost right across from Brudesløret was the next high-volume waterfall called Ljosurfossen (also spelled Ljosurdfossen) on the Ljosura Stream on the south side of the fjord. For the most part, we were looking against the sun during our midday tour. Yet despite the high angle of the sun, the falls was still in shadow when trying to view this waterfall that was mostly draped in shadow. 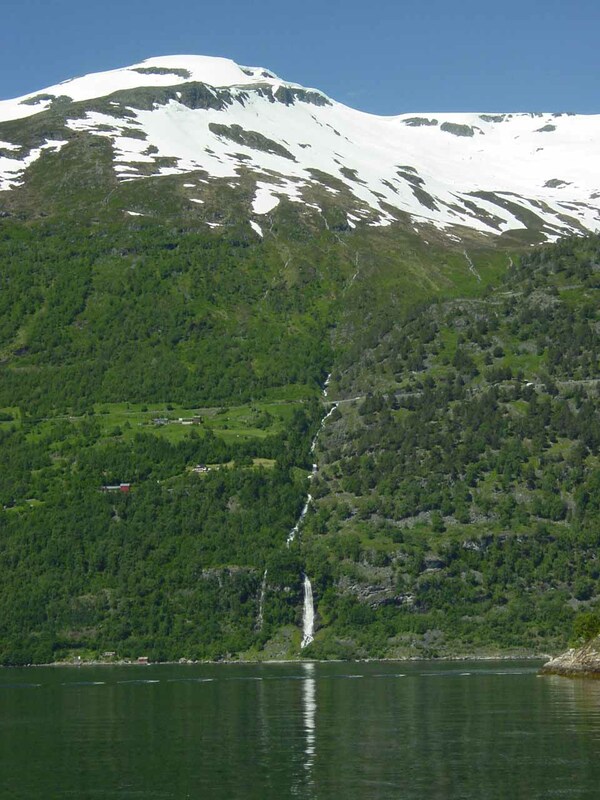 Around this falls were more abandoned farms – one closer to the fjord itself while others were way up the cliffs. Julie and I particularly remembered a story told by the cruise that there was a farmer who lived in one of the higher farms that never had to pay taxes his whole life. For when the tax collector came by, he’d cut the only rope access to his farm thereby preventing anyone from coming up to harass him. 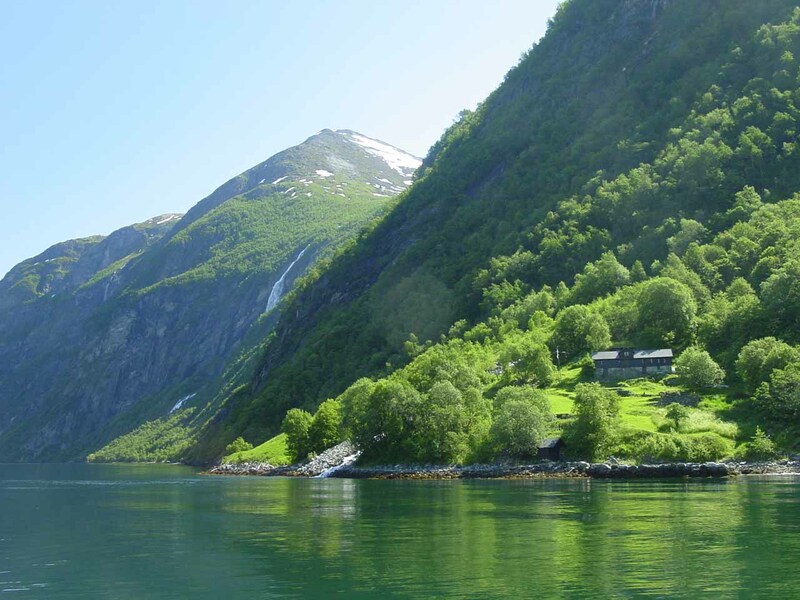 The cruise ultimately made it all the way out to the junction of the Geirangerfjord with Sunnylyvsfjord (Sunnylyvsfjorden). 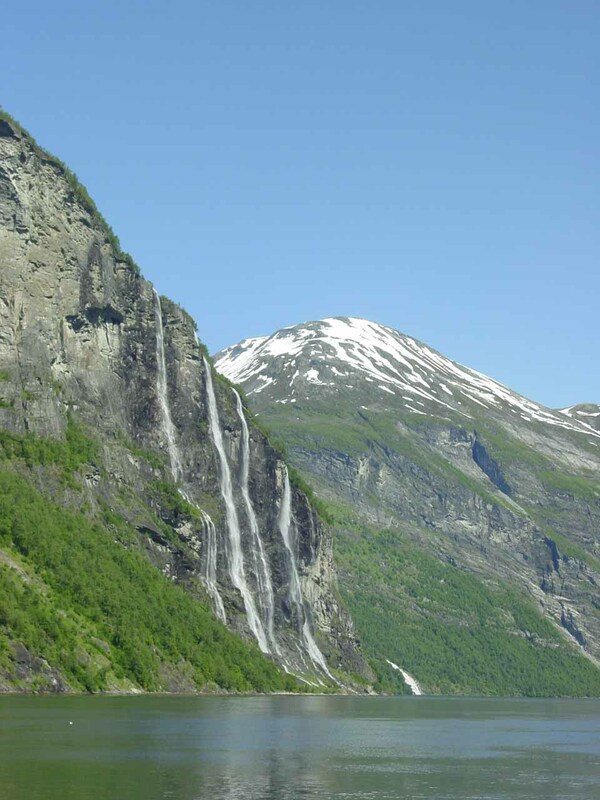 Then the cruise turned back at headed east to Geiranger allowing us to re-visit all of the waterfalls once again before ending back at Geiranger. 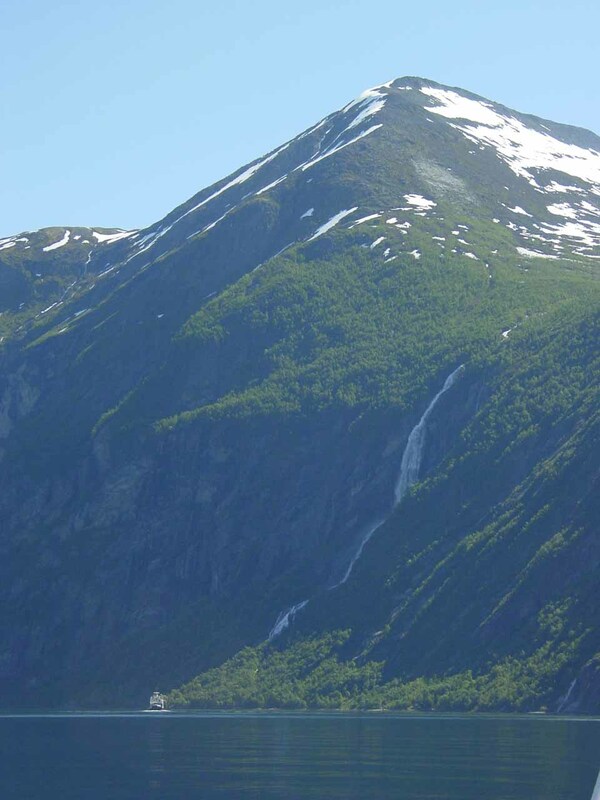 As the boat was turning around, we got to see a distant waterfall called Hellesyltfossen within the town of Hellesylt way in the distance. 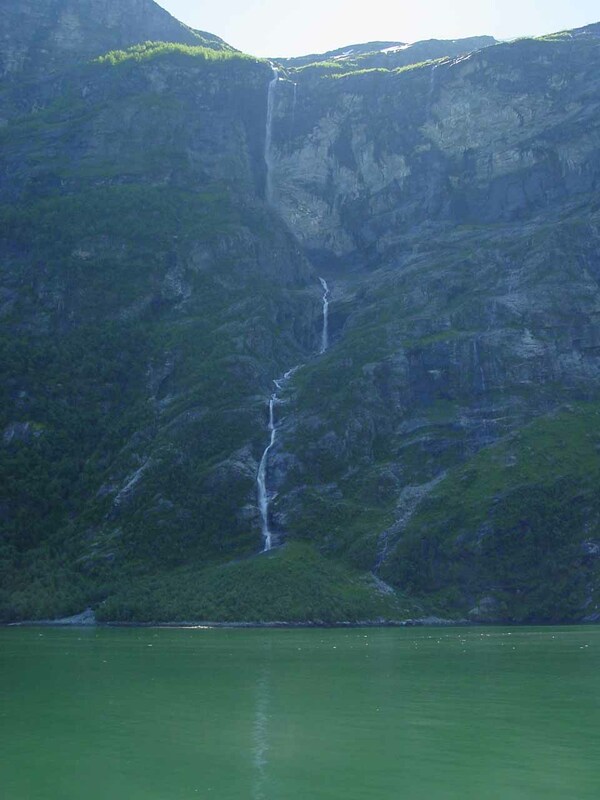 We also glimpsed other other tall waterfalls along the Sunnylyvsfjord. 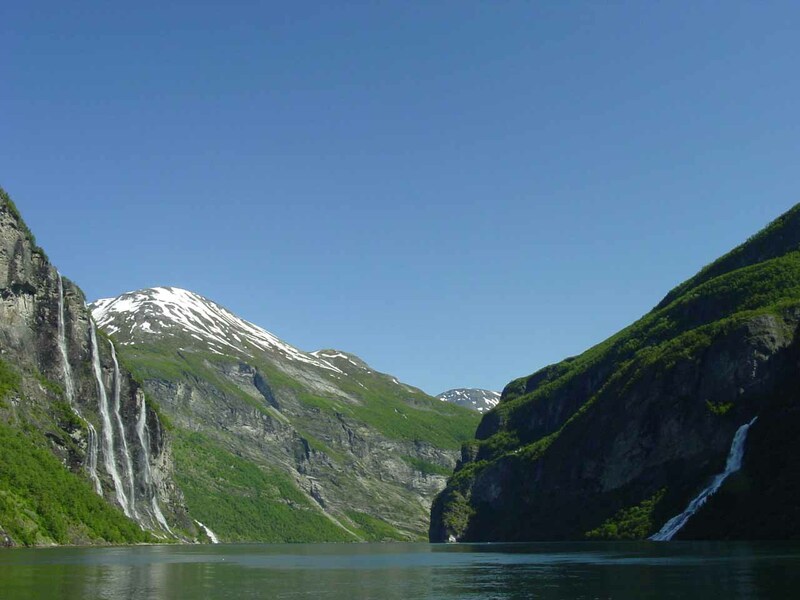 Meanwhile, as we headed back to Geiranger, we started paying attention to other unnamed (and possibly named) waterfalls within Geirangerfjorden itself. Indeed, there were simply way too many waterfalls to single out in addition to the more major ones we’ve singled out on this page. 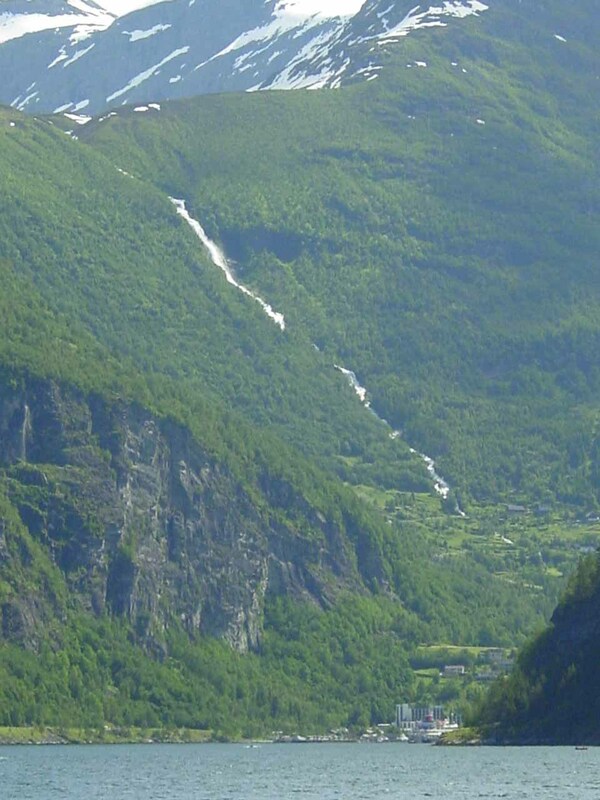 Anyways, just as we were about to return to Geiranger, Julie and I noticed there was still another tall sloping cascade right behind the town. 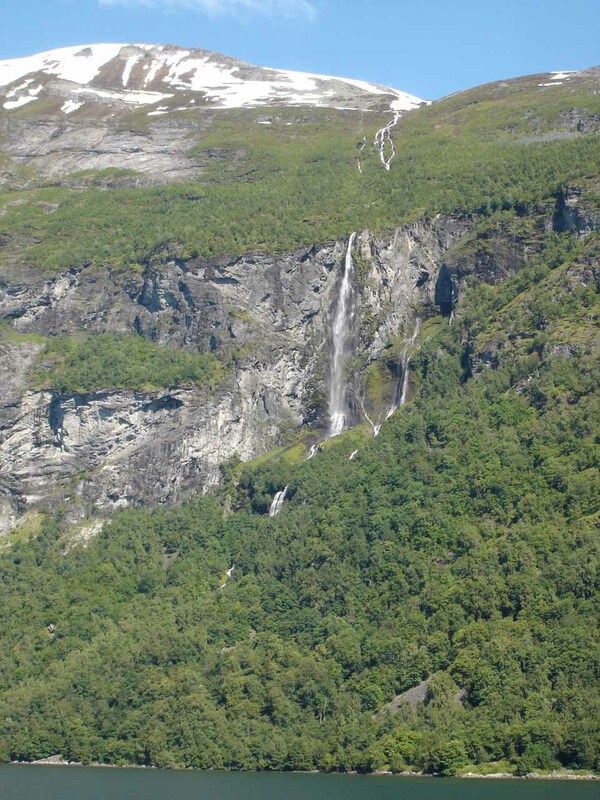 To our knowledge, this waterfall didn’t have a formal name, but since it was coming from Grinddalen (according to the maps), we decided to call it “Grinddalsfossen”. 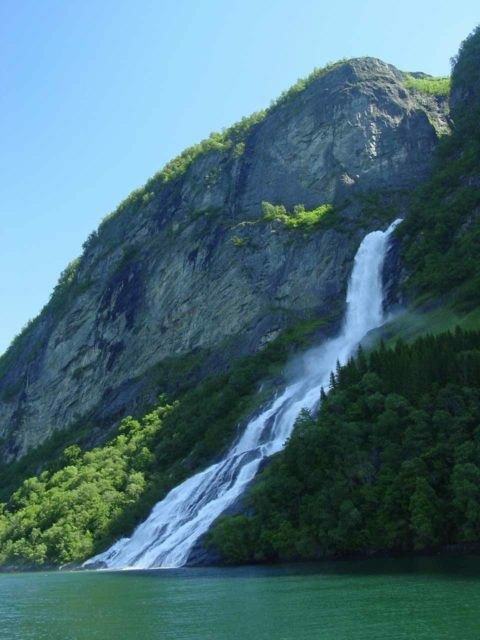 When we did the Storsæterfossen hike after the cruise, we’d find out that we would get to see more of Grinddalsfossen as well. Finally, in terms of time commitment, our tour took about 2- to 2.5 hours. 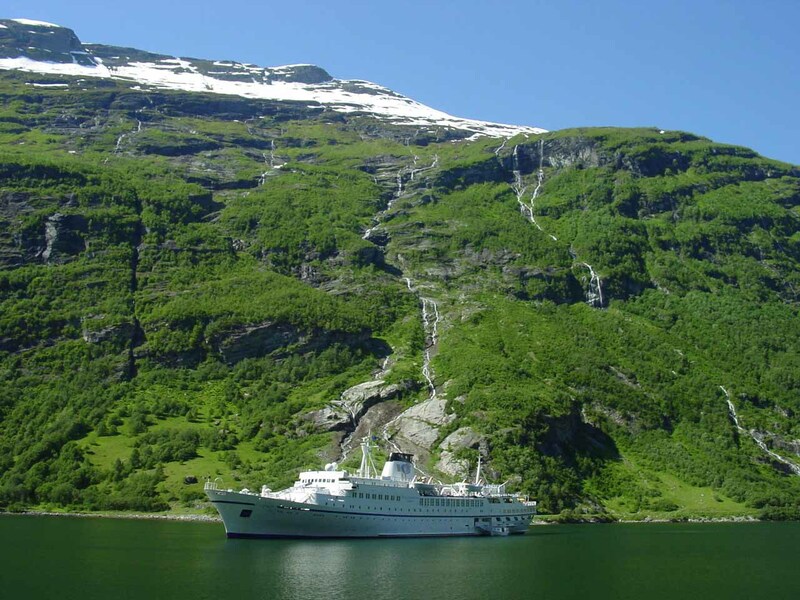 Given the popularity of the cruise, it got quite crowded and getting the choicest viewing positions wasn’t easy. I’d imagine that the higher the seat, the better the viewing experience as fewer heads would be in the way. I didn’t recall how much the cruise had cost, but I did recall it seemed to be pretty reasonable. 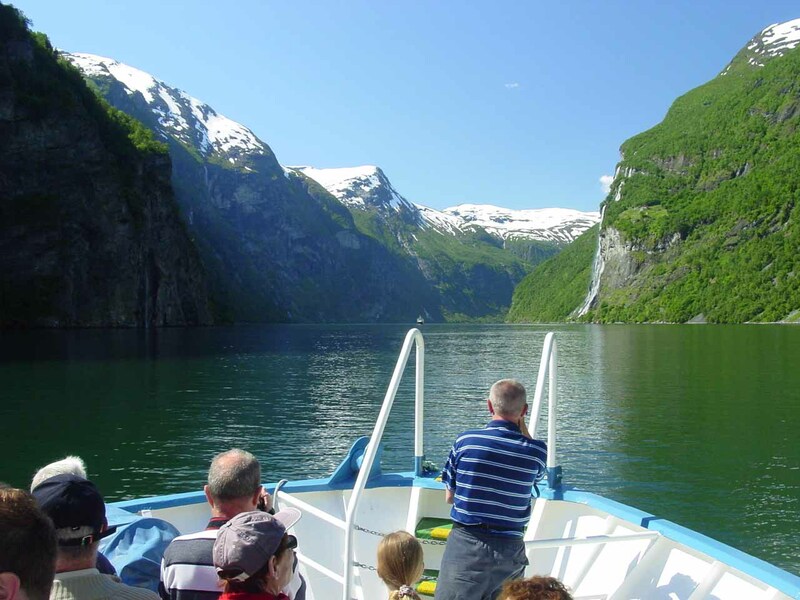 There were other motorboat-hire options available, but I think to truly see the whole fjord like we did, a more powerful boat would be necessary given how much there was to see along the way and the distances that needed to be covered in a short amount of time. At least that was our thought process that ultimately resulted in us going with the common tour option. 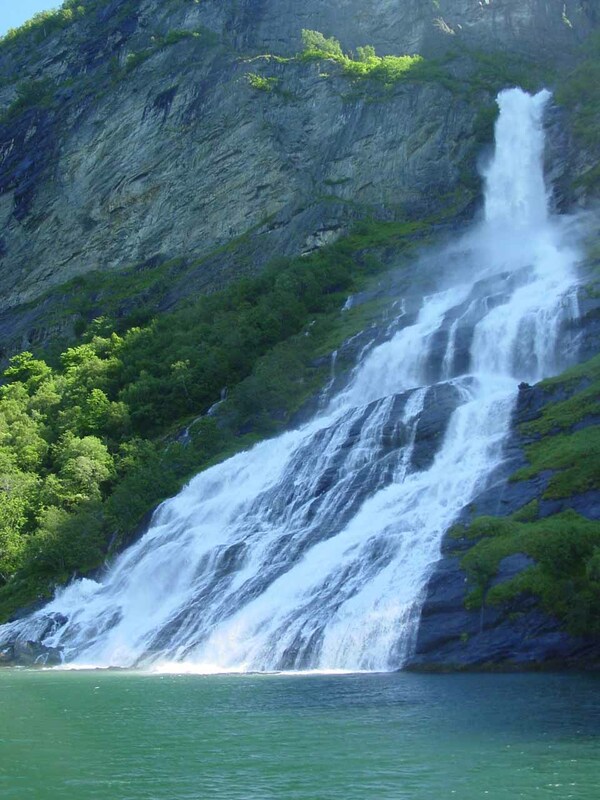 The Seven Sisters and the rest of the Geirangerfjord Waterfalls reside in the Stranda Municipality. For information or inquiries about the area as well as current conditions, visit their website or Facebook page. 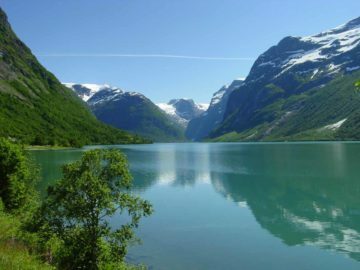 To get to Geiranger, we drove from Loen along a combination of the Route 60 going west then north to Stryn (11km) then going east on Rv15 for about 51km to the Route 63, then going west then north on Route 63 for about 24km to the port at Geiranger. I recalled the parking situation was a little tight though I’m not sure if it has improved or gotten worse in the years since. 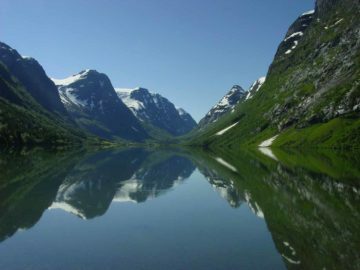 It’s worth noting that about 3km south of Geiranger on the Road 63, there was a beautiful top down view of the fjord called Flydalsjuvet. 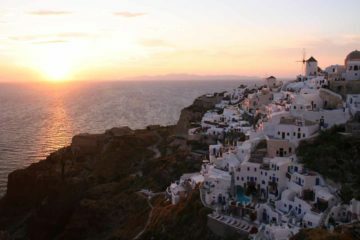 It was definitely worth a stop for the photo op as many tour buses would stop here as well. 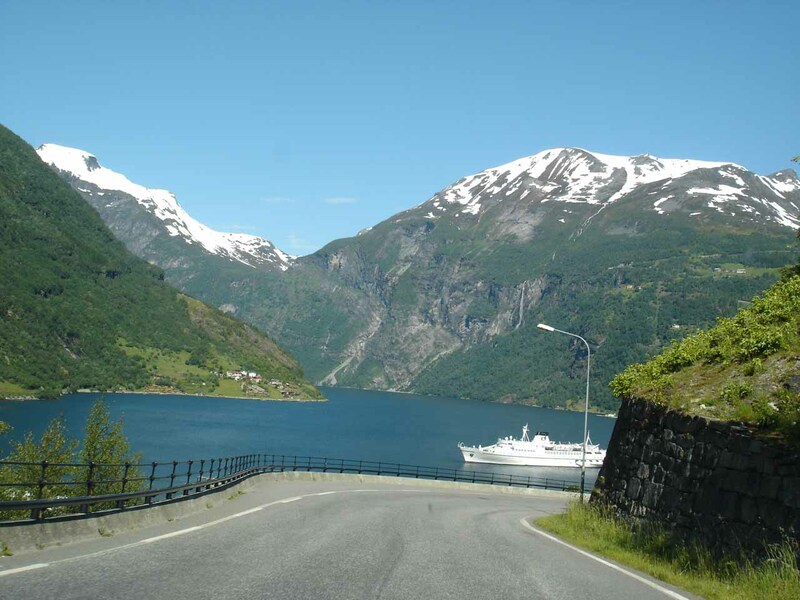 Had our driving route included Hellesylt, we could have entertained going through Geirangerfjorden in only one direction between Hellesylt and Geiranger on a transport ferry. 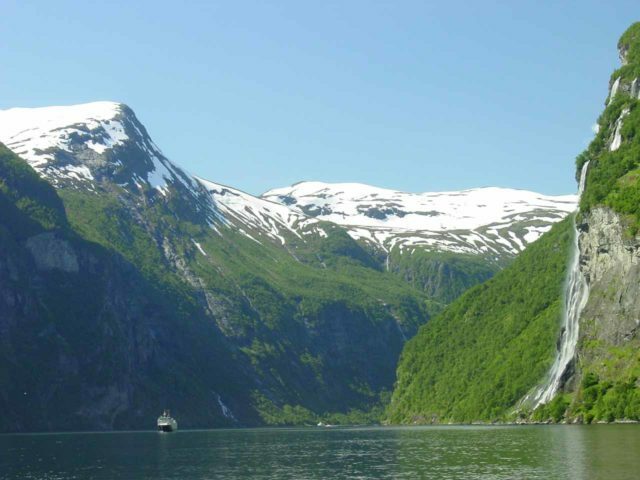 While I’m not sure about how the viewing experience would be on such a ferry, it might be something we mind find worth considering if we’re fortunate to return here on another trip to Norway. 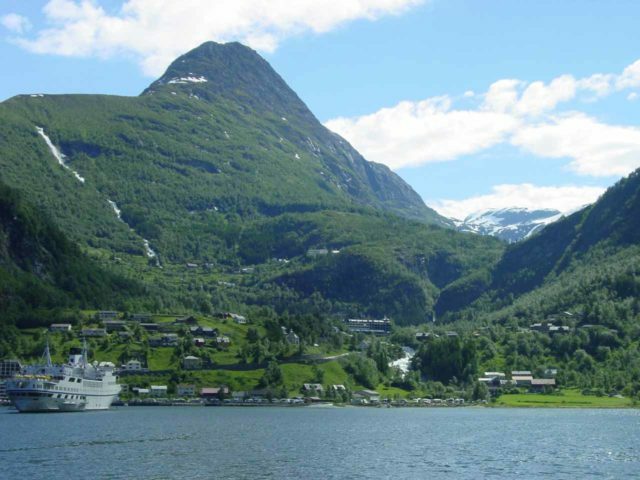 For context, Geiranger was 75km (90 minutes drive) northeast of Stryn, 448km (6 hours drive) northwest of Oslo, 371km (6.5 hours drive with some ferry crossings) northeast of Bergen, and 376km (5.5 hours drive) southwest of Trondheim.